The AIDS Quilt was founded in 1987 as a memorial to those who had died of AIDS as well as a visual tool to help people understand the devastating impact of that frightening disease. 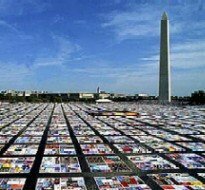 More than 48,000 colorful 3-foot by 6-foot textile panels commemorate the lives of more than 93,000 people lost to AIDS. Measuring more than 1.3 million square feet, if laid out in its entirety, the AIDS Quilt would cover more than 29 acres of land. This monumental quilt is an example of a memory quilt and an awareness quilt. It is a poignant memorial, putting names, and sometimes faces, to thousands of victims and their loved ones. Because of the powerful impact the Quilt has on its makers as well as visitors, the AIDS Memorial Quilt has redefined the tradition of quilt-making. In response to contemporary circumstances the AIDS Quilt has become the largest ongoing community arts project in the world. With its powerful message of hope, the Quilt was nominated for a Nobel Peace Prize in 1989. In early 1994, my little brother, Alan Keith Martin, was taken from us by AIDS. For years we had been with him, both in his personal struggle with the disease, and in his grief as his friends succumbed to AIDS. 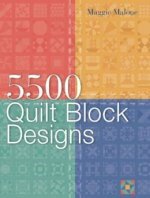 Time after time, we would have "sew-ins", where we gathered to make signature blocks to send to family and friends, or to sew blocks together, or to finish the portrait panels. Somehow, each time we got through it, always together. 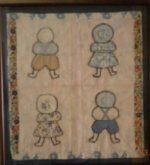 After Alan's death, we (my mother, sisters, friends of Alan, and I) began the tearful work of creating his quilt panels. A photograph of Alan was digitized and transferred to various colors of felt. The felt was then layered on a large piece of fabric and appliqued, creating a very large, realistic rendering of the original photograph. His signature was also enlarged and embroidered onto the fabric, with the dates of his birth and death embroidered underneath. Very plain and simple, the picture panel is a stunning portrait. We distributed blank fabric squares to many of his friends with the request that they put a remembrance or memory on the square and send it back to us for inclusion on the memory panel. They were not restricted in any way (other than that it be permanent and durable) and the response was overwhelming and touching. Photographs were transferred to the fabric, and poems and loving messages were written or embroidered. Then we trimmed the blocks and sewed them together to make a 3-foot by 6-foot panel. The two panels were submitted together and are side by side within an 8-panel block, a touching memorial to a remarkable young man. This block is one of many that contain only panels from Fort Worth, Texas. 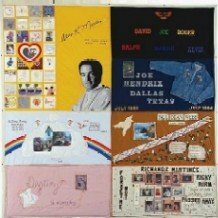 Every year, in a tearful candle-light ceremony several new "Ft. Worth" blocks are displayed before being forwarded to the AIDS Memorial Quilt in Washington, DC. 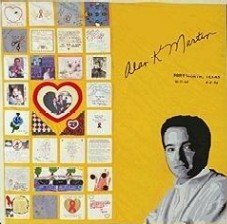 We were privileged to have had Alan in our lives, even for so brief a time, and in some ways it's comforting knowing he has been immortalized, both in the Quilt as well as in our memories. In an effort to put Alan's fight and ultimate death into perspective, I made a panel for him representing the family he left behind. Using simple applique techniques, I attached little cutouts, gingerbread boys and girls in fabrics that in some way represented each individual in the family -- mother, sisters, brothers-in-law, nieces, and nephews -- in successive rings around Alan's picture. I even included his two beloved dogs. Names of the individuals as well as other information were embroidered on the top. Like so many other panels in the AIDS Quilt, this panel represents loss, plain and simple. Untold thousands have been touched by AIDS as the epidemic continues to claim lives here in the United States as well as around the world. As a result, the AIDS Quilt continues to grow and to reach more communities with its messages of remembrance, hope, and awareness. Has the AIDS Quilt touched you in some way? 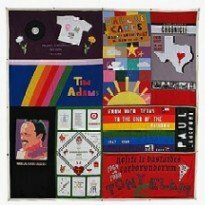 Do you have a great story about the AIDS Quilt? Have you made a panel in remembrance of a loved one? 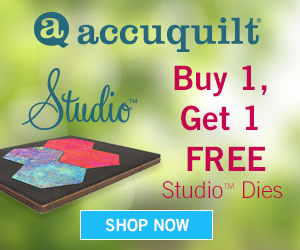 Have you visited the Quilt in Washington, D.C.? Or one of the traveling displays? Please share it! Tell us about the special person you honored. How they touched your life. What was your inspiration for the panel you made?